Every day, Watch This offers staff recommendations inspired by the week’s new releases or premieres. This week: In honor of the American Idol series finale, we’re revisiting our favorite television episodes featuring a talent competition. Mel Blanc is most famous for being the “Man Of A Thousand Voices,” bringing to life Bugs Bunny, Porky Pig, Daffy Duck, and many other alliterative heroes in the Warner Bros. cartoon stable. Even before that, Blanc got his start on radio. The obviously aural medium made quick use of a voice talent like Blanc, who could play numerous characters on a single show, just by switching his accent and offering a bunch of sound effects. He eventually landed on the most popular radio series of the golden-age era, The Jack Benny Show, which ran on Sunday nights at 7 for many years, easily defeating whatever unfortunate show drew the same time slot as his program. Blanc was a utility player on Benny’s show, depicting deliverymen, train-station announcers (“Anaheim, Azusa, and Cucamonga”), stagehands, and most famously, a department store clerk who loses it at the holidays. Benny’s staff realized Blanc’s amazing versatility the day that the sound effect for Benny’s car Maxwell failed, and he easily stepped in to imitate the car. As the television era dawned, Benny was one of the select group of radio stars to make the jump. His deadpan, slackjawed pauses whipped an audience to laughter on screen just as they did over the air. But on TV, many of Benny’s background players finally came to the forefront. 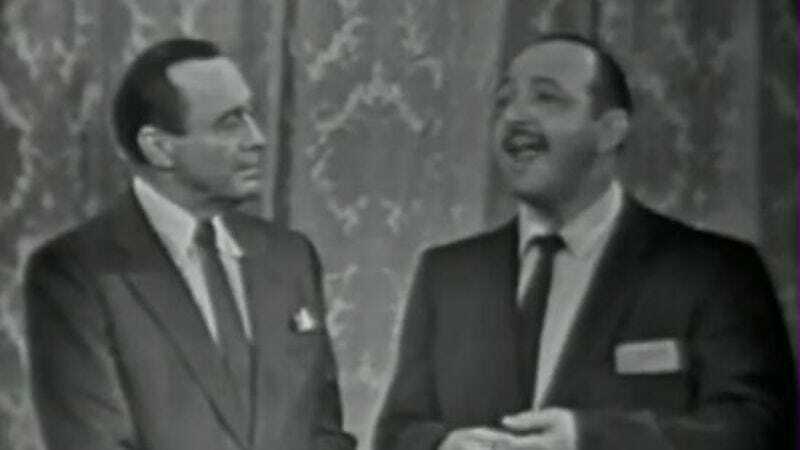 An early example was Benny’s “Talent Show” episode in 1956, back in the fledgling days of TV. Benny didn’t have much of a set for most of his show, standing in front of an austere curtain. Where his contemporaries like Sid Caesar and Milton Berle went broad in their humor, Benny got more mileage by going small. His nuanced wit usually let someone else take center stage (think of Benny descendants like Johnny Carson or Conan O’Brien). This episode starts out with a cameo by Jayne Mansfield, followed by a song and dance number pushing Lucky Strike cigarettes by the brilliant Eddie “Rochester” Anderson, Benny’s longtime sidekick. At around the 11-minute mark, Benny says he’s promoting new talent in an amateur contest. He brings out Blanc, posing as a Mr. Gropff, who, surprise, can do numerous impressions. Rumor has it that Blanc was so versatile, Benny’s staff would often try to stump him, coming up with suggestions like “English racehorse,” which he pulls off here. Blanc also demonstrates how he created a variety of his original sounds, from a St. Bernard to a one-man band. Even more amusing than watching Benny trying not to laugh is seeing Mel Blanc doing what he was the best in the world at doing, in front of the camera at long last. Availability: “Talent Show,” from season seven of The Jack Benny Show, is available in DVD box set and also on YouTube.